We already reported some initial Pepsi MAX Super Bowl 2012 Ad details, but now we have to full insight. Pepsi will air a 30-second spot during the Super Bowl 2012 promoting Pepsi MAX. You can watch the extended version of the Pepsi MAX Super Bowl 2012 ad below now. The Pepsi MAX commercial entitled "Check-Out" is the newest edition to the brand's playful Cola Wars campaign. The spot depicts a competitor's deliveryman attempting to discreetly purchase a bottle of Pepsi MAX at the supermarket when he unexpectedly becomes the grand prize winner of "Pepsi MAX for Life." As a surprise "on the spot" reporter, Regis Philbin appears to get the embarrassed driver's thoughts on his big win. This role marks Philbin's first television project since leaving Regis & Kelly. Pepsi is known for featuring great music as part of its Super Bowl ads, Pepsi MAX tapped Sugarland's Jennifer Nettles to record a renowned country ballad to accompany the spot. "The 'Check-Out' ad was developed to extend the legendary cola wars through a humorous scenario," said Amy Wirtanen, Senior Director, Pepsi Marketing. 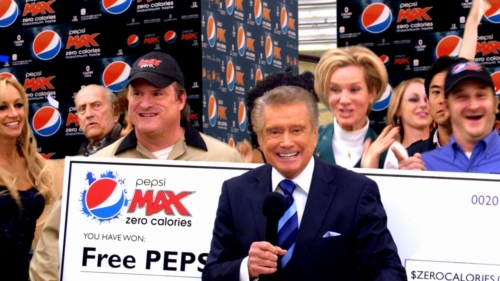 "The brand has a history of producing star-studded Super Bowl ads, and as one of the most iconic personalities to ever appear on television, Regis Philbin with his witty sense of humor was a funny highlight for this commercial." A longtime Super Bowl advertiser, Pepsi will also debut the highly anticipated X Factor spot featuring winner Melanie Amaro and Elton John during the game this year.